It’s been a rough few months for my photography. I ended up spraining my arches in my feet early this fall, and the injury wouldn’t heal. That sidelined me from hiking anything big this fall, and once the leaves fell, I decided to take it easy and recover. I planned on shooting lots of holiday scenes this December, but the snows never came, and my camera remained dormant. Determined to break the camera out one more time in 2011, I went over to the coast to capture sunrise. Beach scenes are great to shoot in the transition seasons, as they are uncrowded, and don’t rely on snow to make them look good this time of year. 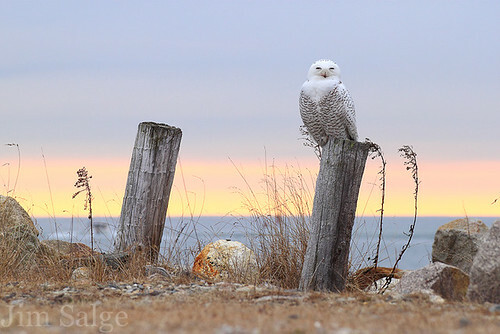 In the back of my mind though as I headed over was the irrupption of snowy owls that have taken residence along the New England Coastline this year. 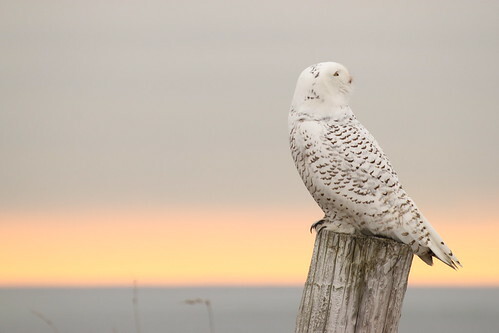 Snowy owls live most of their lives above our northern border. 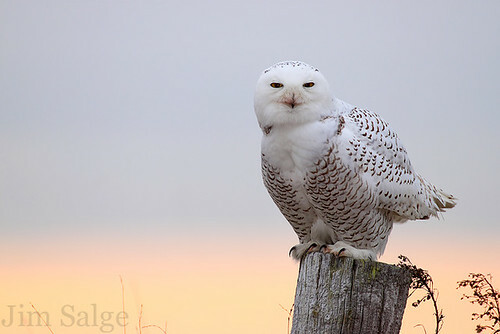 They breed around the arctic circle, and head a bit further south into Canada most winters. 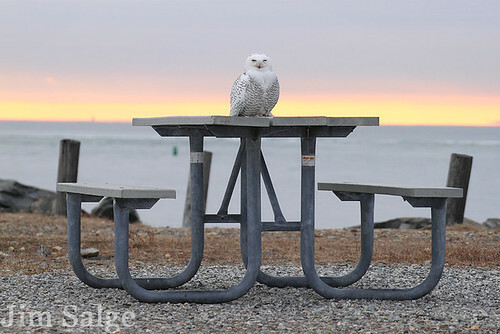 A few are seen each year along the New England coastlines, but I’ve never seen one. This year however, the population of lemmings and rodents has been reported to have crashed, which, following a few successful breeding years, has caused the population to migrate further south and spread out in search of food. There have been sightings all along the New England coast, including down to Connecticut and Long Island. After a pretty, but non-photogenic sunrise, I walked the beach seeing if I could spot one of these beautiful birds. Nothing. I was on my way back to the car when it flew right in front of me though, and perched near the parking lot. I spent the next few hours crawling around on my belly, inching up on it at two different perches. It first rested on a picnic table, before moving to some posts right on the water. It was fairly tolerant of my presence, often napping in fact, but if I moved to fast it did this circular head bob showing its irritation. The whole time I was shooting it, the horizon maintained its pastel hue, as an incoming storm kept the light soft. A few snow flakes fell overhead as well, but it fortunately wasn’t too cold or windy, or the experience wouldn’t have lasted as long. At about 10:30, I was about 15 yards from the bird, flat on my belly, when it started looking around nervously. Seconds later, three crows swept in, and chased it off of its perch. It flew over the dunes…and out of sight. Owl Spotting the Crows Just Before Leaving ... Love How They Move Their Necks! I’m hoping that they continue to stick around this winter…as they are a rare and beautiful sight in these parts! The End Of Autumn…The Return to the Blog! Hi All! It’s been a while! Since early August, all of my writing and photography time has been focused on a blog that I maintained for YankeeFoliage.com. That gig has run it’s course and I am again returning to maintain my own blog through the winter and spring season. This autumn was a challenge photographically, as many areas failed to see any real peak. There were areas of good color to be found, and I came away with a solid half dozen images that are definately going into the portfolio. 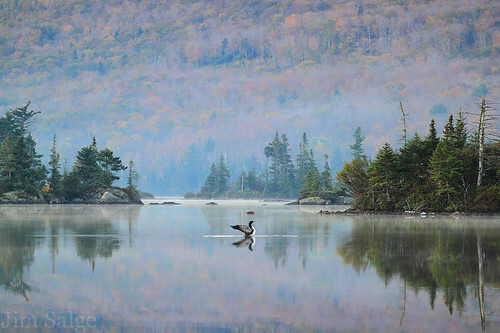 My favorite shot of the season was this image of a loon stretching on Long Pond before daybreak. 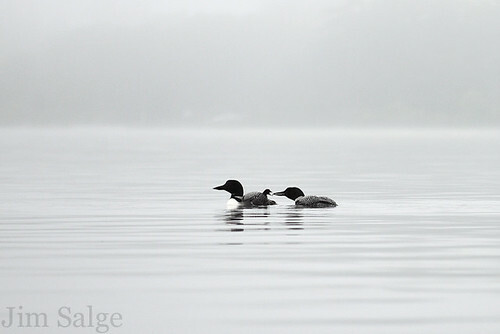 The composition was set, and I was patiently waiting on the first light to hit the hillside above the lake, when a family of loons moved through the frame. I adjusted my settings for a fast exposure, and in a burst of five shots, found this image on my card! It was a special moment to witness, and a lucky shot to pull off. Much of my other new work, all with it’s own unique story can be seen at my ‘New Images Gallery’ on my website. I hope to be able to bring many more special moments to you this winter, in my quest to capture the very best light and atmosphere in the New England landscape this coming season! I am largely a three season hiker. Probably not in the typical sense of the word though. My hiking season begins in early fall, and continues right through when the leaves fill out on the trees. Definitely including winter. Rarely in summer. I just don’t deal with the heat well. My ideal temperature is about 25 degrees Fahrenheit, though I don’t mind 60 either. Anything over eighty pushes it. Add humidity, and I’m done. Kayaking has become a more than suitable replacement for day hikes, but I’ve never really combined camping and kayaking in the way that backpacking satiates my backcountry fix during the rest of the year. My friend Karen and I decided to give it a try on Lake Umbagog this week, which is one of the most remote and beautiful lakes in New Hampshire. A few mile paddle found our site on a private island teeming with small songbirds. 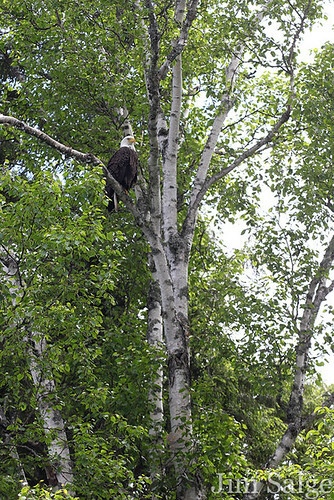 The shoreline surrounding the island was perfect moose habitat, and there were eagles soaring over the neighboring cove. Wildlife paradise. Just paradise. Over the next few days we paddled much of length of the lake, fished, and watched wildlife. 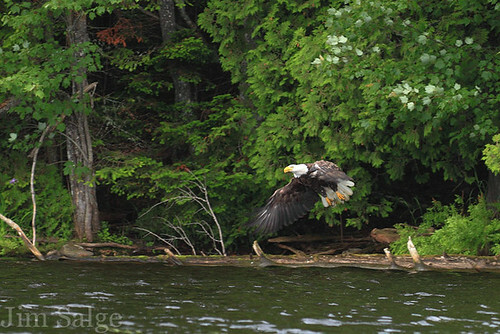 We saw at least six different eagles, and a merganser with an unbelievable clutch of about two dozen young. Loons woke us up before the sun, and the bugs abated for midday naps. I didn’t do much professional style photography, but took many snapshots of the scenes and wildlife we encountered. Photographically, I’ll consider it a scouting trip. If I can pass along any tips gleaned from the trip for someone taking their first overnight out of their kayak, it’s to use smaller bags. We both were independently under the impression that a few large dry bags would work, but when stuffing the boats hatches, it just didn’t work. More, smaller bags fit much better in the boat. Otherwise, it’s just like backpacking, with fewer concerns about pack weight. And for me, much more enjoyable in the summer! 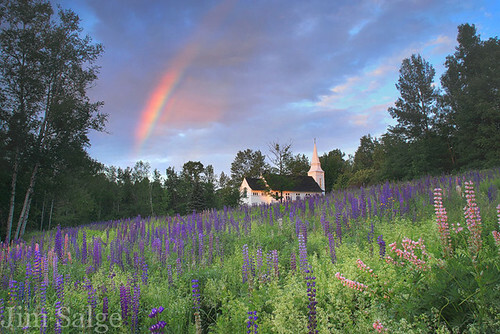 When I moved to New England about a decade ago, I was struck by all things iconic New England. Covered bridges, cold trout streams, rocky coast lines, old mills. In the natural world, I don’t think anything gives me more of authentic not in New Jersey feeling than the call of loons at dawn from a misty lake. I was given some great information last week that a loon had hatched on a local lake, and was eager to show off the chick to kayakers. I am not a wildlife shooter, but will take any opportunity to experience exceptional natural events. 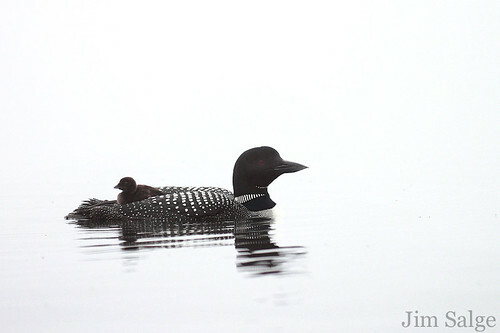 I’ve always wanted to see a loon chick riding on its mothers back, or see its father bring food over. I had no illusions that I’d be able to get a shot, but just wanted to observe. The fog was thick when I arrived, and only getting thicker. 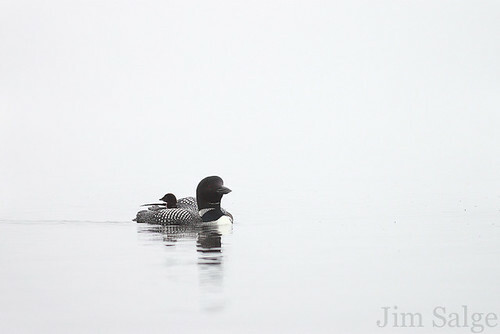 I found loons by following their haunting calls, and also found myself alone with the birds for a bit before other photographers arrived. Much to my delight, they were willing to continue their normal behavior despite my presence. And all of the behaviors on the life list took place right in front of me! 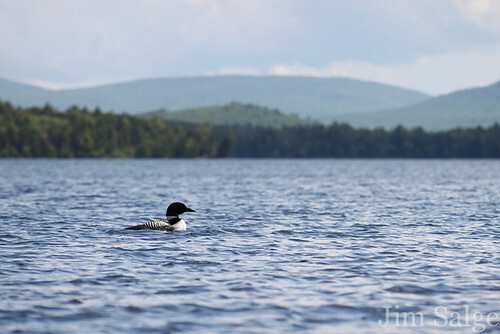 The images I captured I think are rather unique, considering how much quality loon photography is out there. I used the fog to set a serene scene of solitude. I shot the birds as I would a fresh snowfall, overexposing to render the fog white instead of gray, and let the dark tones on the birds fall as they may. The result was a peaceful, and to me, pleasing, high key scene. I can’t wait to see how these print up, as these are shots that I want on my wall, captures of some iconic moments of idyllic New England. So much of landscape photography is being at the right place at the right time. Many point to luck as the reason a shot comes together, but you really have to make your own luck in order to get consistently good shots. Learning what lighting conditions are conducive for certain types of shots is a good start. Using weather forecasts to anticipate these conditions ups the odds. Knowing seasonal cycles at a location can make or break a scene. Put it all together, and then you rely on luck. I was in Woodstock, Vermont last Friday, finishing a great shoot on some rare orchids, and was faced with a decision. Drive to Sugar Hill and gamble on a break in the showers to create some clouds at sunrise and possibly some low lying fog. Or stay local and shoot the Queechee Balloon festival, which was more of a sure thing. Ultimately, I ended up in the lupine fields. I was the only one. The forecast scared off the other photographers, and the town was empty. I checked out the lupine conditions until dark, and planned my morning shoot for a variety of conditions. Dawn was looking to be a bust. The showers had held off, but clouds choked much of the eastern horizon for the sunrise. I was packing up to move onto plan b, when I turned around and saw a brilliant rainbow in the west. I raced to a spot I hoped would combine the rainbow with other intriguing elements, and couldn’t be happier with the scene I saw. It only lasted another minute or two after setting up, but it was all I needed, thanks to scouting, planning, anticipation, and yes…luck! 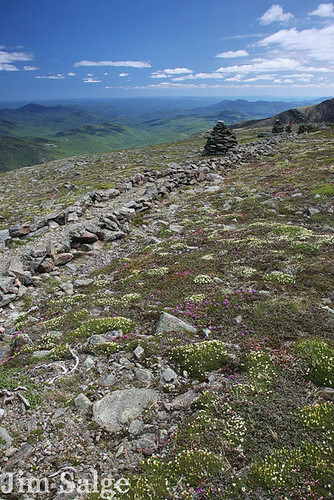 The land above treeline in the White Mountains has been described as an arctic island in the sky. 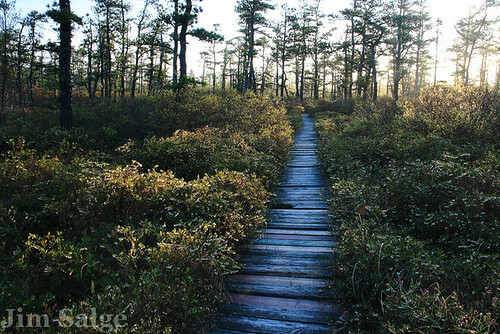 Plants that were once prevalent all over New England after the last ice age have retreated to the only place they can out compete other species, and where few other plants can tolerate living. To find similar species in any abundance, you’d have to travel to near the arctic circle, and some plants are found nowhere else on Earth. Most of the year, these plants look lackluster at best, and most times downright drab. Cushion plants that grow extremely low to the ground, and sedges spend ten months a year decked in the color brown are rarely a cause for pause. 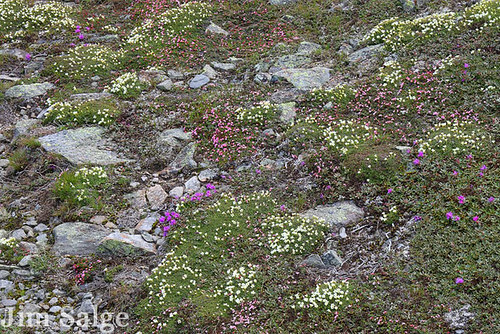 For a few short weeks a year thought, the tundra undergoes a rapid transformation into a lively and vibrant colorscape. I set out this week to tour around the summit cone of Mount Washington, and immerse myself in, enjoy and document this year’s bloom of alpine flowers. The weather did not cooperate with my plans, which is usually the case in the “Home of the World’s Worst Weather.” The days before my planned visit, temperatures dipped, winds blew a hurricane, and ice coated the upper cone. But these plants are hearty, and have seen adversity before. Saturday, as ice clung to the cairns, the flowers melted out and continued the show. And it was beautiful. 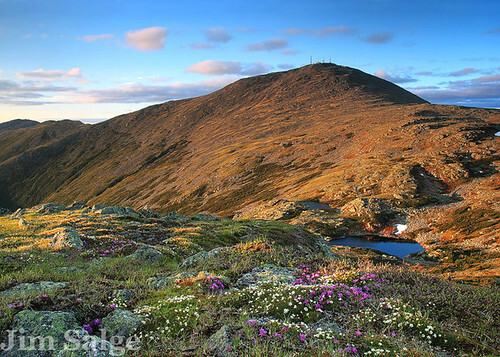 The three common species of plants on Mount Washington are Diapensia, Lapland Rosebay and Alpine Azalea. The latter of the two closely resemble miniature versions of shrubs in my yard, and the diapensia is all together unique. The flowers are easily the largest feature of the plants, and starkly stand out against the low landscape. It inspires awe, and for me, art. The beauty of these plants call me to the summits every June, and Saturday, the perfect weather drew me to stay out late. I scouted a scene on Mount Monroe, and waited and hoped for soft sunset light for a few hours. When the sun finally dipped below the clouds and lit the summit cone, I was able to capture an image I’ve visualized for years. An image I hope can lend itself to further education and protection of this fragile environment. Great effort and care needs to be taken to protect these fragile post-glacial relics, and many organizations have really gone to bat for them. Scree walls line the most fragile areas, funneling traffic away from plant communities susceptible to damage from even minor human traffic. Efforts in education and conservation have paid off as well. 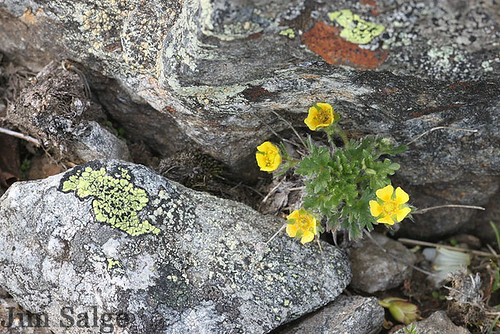 The entire Crawford Path was even redirected away from the endemic and formerly endangered Dwarf Cinquefoil, which is one of under two dozen species to have ever been taken off the Federal Endangered Species List. Hmmm….nearly two weeks of rain. Straight. Literally have seen the sun once in this time frame. Photosensitive flowers have given up…my lilac bush never really opened, just budded, and waited, and waited, and browned. But the forests have greened. Very green…the colors have become incredibly saturated, and I’ve been enjoying shooting this color while dodging the rain drops. 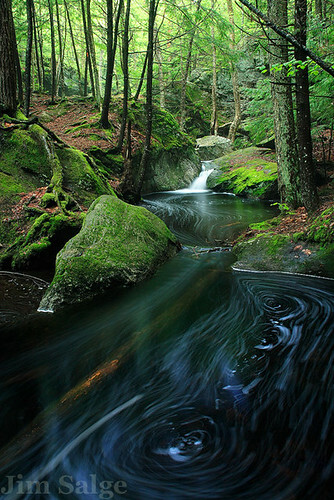 A perfect example…here’s a small falls on a brook at Pulpit Rock Reservation in Bedford, NH. Love that color! 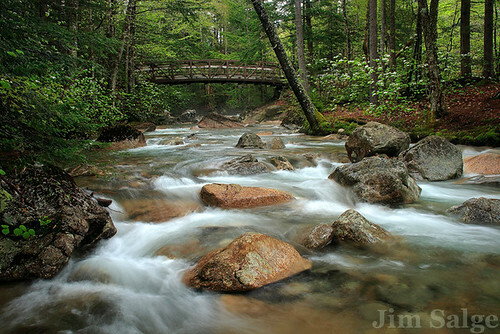 This past weekend, I took a trip up to Franconia Notch to capture spring green and swelled streams in one of the most beautiful locations in the White Mountains. 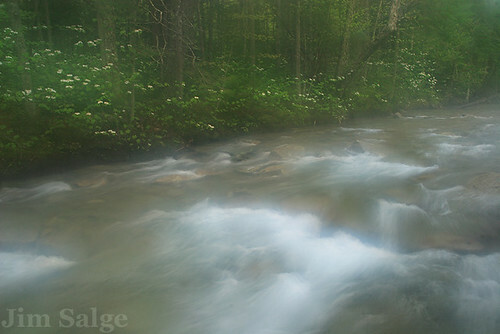 I focused on the Pemi River proper, as though the floor of the notch had seen spring, the mountain walls were a bit behind. And finally this year, I timed things right! One of the more showy flowers in the White Mountains is the oft hated hobblebush. Hated, as it grows quickly, chokes trails, and is the bane of bushwhackers bagging remote peaks. But in the spring, it displays an impressive white flower cluster, in the fall it turns a kaleidoscope of colors, and in winter, it feeds the moose. So I like the plant. And it lines the Pemi through the notch! Shooting it though, on yet another misty, drizzly, humid day, poses certain challenges. 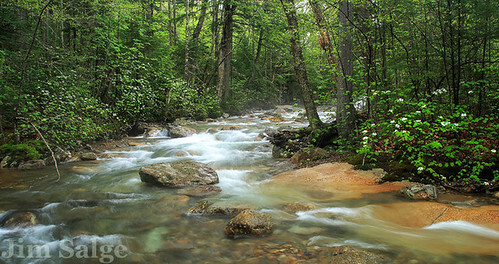 Wading in the slowly warming river, I can attest that the mountain streams are still cold. And the channel proper is about 10 to 20 degrees cooler than the surrounding bank. And when the camera cooled down, and was brought back out of the channel, the lens looked like your sodie can in summer…covered in condensation. Most of my shots were ruined by water drops from rainfall or incompletely cleared condensation. Patience and perseverance did rule the day, and I cane away with a few that I like. Though even the first one has a big drop conspicuously inconspicuously hidden over a foreground rock. The other works only after cropping the top and the bottom. But they do capture the essence of the spring so far, damp, wet, green and beautiful! This season’s wildflowers are certainly following a different order and time frame from last year. Spring came about two weeks early last year, likely confusing the migrating birds and nature photographers alike. And there were consequences to this…an early May frost killed off most of the apple blossoms that were ahead of schedule…and a fall without apple picking ensued. This year, the time frame was more normal, but the lack of sun and abundance of rain threw off some of the clues and connections I like to see when I pick a location I think will be in bloom. Example, this weekend at the Saco Heath. Last year, the bloom date for the rhodora was May 6th, and it’s peak was a few days after a more local bog, the Ponemah Bog, which I photographed in bloom as early as Late April last year. This year I followed the normal pattern, and arrived at the heath on the 14th, on a perfect morning to find…nothing! I can’t say nothing. The leatherleaf, a small, non showy flower was everywhere. And it was misty, and beautiful, and a turkey nesting near the boardwalk scared the everything out of me (and likely I…it). I was happy with the shot I came away with, but I came away even more confused by the season. Looking ahead at the forecast, I’ll be unlikely that I’ll get another morning like this in the heath this year. So, I’ll add it to the list for next year! And…I’ll look forward to some waterfalls coming up, as it looks like they’ll be running high for a while!